Fix your gut, fix your health. That is the sentiment that Dr. Stephen Barrie espouses in his work as a founding pioneer in the gut microbiome field for the last 35 years. His most recent work in developing Viome provides personalized nutrition recommendations based on your gut microbiome to support your health. Dr. Barrie is a physician, entrepreneur, scientist, teacher, keynote speaker, and author. He founded Genova Diagnostics in 1986 and developed the first clinical intestinal permeability lab test, SIBO breath test, and comprehensive stool analysis. Dr. Barrie has also spent seven years assisting the Chinese Central Government in incorporating Functional Medicine into their healthcare system. 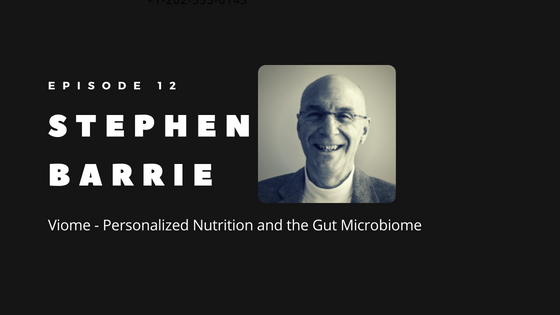 As the Chief Business Development Officer at Viome, Dr. Stephen Barrie has contributed to a system that takes microbiome testing to a new dimension. Viome offers home testing with results accessed through a phone app. Results show gut, metabolic and body scores, as well as what you can do to support keeping your gut microbiome, and therefore you, healthy. Viome helps you understand how the bacteria in your gut affects your health, what bacteria you have and how to feed it with foods that are optimal for you. It can even help you support proper blood sugar regulation by recommending foods that help balance your gut microbiome. Listen in as Dave Korsunsky, Founder of Heads Up Health, talks to Dr. Stephen Barrie about how both of their companies help people quantify elements of their health — sometimes a puzzle! –and how this health data empowers users to take control of their health so they can make their own decisions.